Call Yourself A Nerd Are you a nerd? Second episode of a brand new series; this is where shows usually make it or break it. I have not placed this show into the category of loving it, yet. It still has potential but I need to see more. We being this episode with a flashback to just a week after the blackout, the Matheson family is packing up to leave the city. Rachel makes Charlie promise to never let Danny out of her sight and always hold his hand. This flashback is brought on by Charlie reminiscing about her family, all the while Miles is elsewhere in a fight. Miles in a fight of his life, defends himself against a bounty hunter sent by Monroe. The only thing that prevents Miles from killing this man is Charlie crying out not to kill a man in cold blood. Miles locks the bounty hunter up in a train boxcar. After that situation, Miles decides that he needs help and he will need to recruit an old friend by the name of Nora Clayton. The party arrives in Pontiac, Illinois. Miles tells the rest of the group to stay while he goes off in search of Nora. Drinking is obviously the only form of entertainment as Miles heads to a bar/card house. Of course, the bounty hunter that they had trapped returns the favor by trapping Miles in the bar. This time he has brought back-up, who now hold the rest of the party hostage. Miles is then handcuffed and led out. Miles, being the talented man that he is, escapes as they walk through the market. He wraps his chains around the bounty hunter’s neck, forcing the bounty hunter to reveal that Nora has been sent to a labor camp. What a wonderful world it has become in fifteen years. Miles then proceeds to snap C. Thomas Howell’s neck. At this point, Miles has had enough babysitting so he tells the rest of the party that he will go off to save Nora and they should meet him elsewhere. Of course after Miles leaves, Charlie sneaks off after him. We go back to find out what is happening with Danny being lead back to Monroe by Captain Neville. They happen upon a hunter’s house who has used a shotgun to bring down a deer. According to the Baltimore Act, it is unlawful for citizens to carry firearms unless they are part of the militia. The hunter gives up his shotgun after threatened; but when Neville orders his men to search the house, the man pulls out a handgun and shoots one of the men approaching the house. Neville proceeds to pull out his gun to kill the hunter. They search the house to find a U.S. flag. Neville orders his men to burn the flag along with everything else. We take a quick look at a new character, Sargent Will Strausser, who along with General Monroe interrogate a prisoner who happens to be part of a resistance. Monroe eventually kills the man when he tells Monroe that he is not afraid of Monroe. Maggie and Aaron wake up to find Charlie gone. Charlie in the meanwhile is tracking Miles. As she is doing so, she sense that she is also being tracked. She fakes a fall off a ledge and pretends to have hurt her leg. Nate appears to help her with her injury. Charlie handcuffs the spy to a metal pole nearby quickly. She leaves him there, questioning why he had saved her from the other Monroe soldier. We also find out that Nate is not his real name. We go back to Maggie and Aaron. Aaron is asking why Maggie keeps an iPhone even though it does not work. She emotionally clings to the phone because it contains the only photos of her children, there has to be a way see them again because she is forgetting what they look like. Aaron reveals the mission Ben sent him on and the possibility of power coming back to the world. Now excuse me while I actually print a few pictures. The Monroe soldier that was shot by the hunter is dying. Neville tells him that he can die painful or quick, giving the soldier a vile of poison. Later, they are holding a funeral for the fallen soldier and Danny scoffs at the words Neville speaks. It was not so much against what he said, but a scoff for the man who are speaking those words. 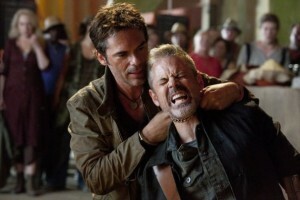 Danny feels that Neville loves this because it gives him an excuse to kill, which in turn Neville begins to choke Danny before coming to his senses. We have a quick flashback where the Matheson family is outside Ben’s workplace. He is gather a few items inside. Charlie loses a ball and goes to chase it but is caught by a disheveled man in a suit. Currently, Miles and Charlie find Nora but she is part of a workforce dragging a helicopter. Miles comments that if Monroe could bring back power, imagine what he could do with the helicopter. In the evening, Miles rescues Nora but she had already picked her chains. Away from the guards, Nora explains that she had herself caught so that she may try to get the sniper rifle that the warden of the chain gang has. Nora will join the group if they can help her get the rifle, a fetch quest if you will. Nora fashions together a handmade gun that would fit on the back of a person’s wrist. It is decided that Charlie would be the one to approach the warden to kill him. Miles and Nora are focused on the rifle, but Charlie is more focused on freeing the prisoners. Charlie poses as a lost hunter. The guards question her, but the warden says that he knows the area well and can help her. A quick flashback with the man in the suit holding Charlie. He threatens to snap her neck if they do not give him their food. Ben comes out with a gun pointed at the stranger. He walks Charlie up and releases her to Rachel but grabs one of the carts with the food. He walks away confident that Ben will not shoot. He is right, Rachel ends up taking the gun from Ben and shooting the man that threatened her daughter. Focusing back on Charlie, she uses the makeshift gun to kill the warden while Miles and Nora clean up the rest of the guards. One of the guards gets on top of Charlie, forcing her to use the rifle to kill the man. This later causes Charlie to be distraught about the lives that she has taken. After taking off her shirt to clean a wound, Miles finds out that Nora has a U.S. flag tattooed on her back. It represents that she is part of the resistance, trying to reinstate the United States. Nora does not intend to sell the rifle on the black market like she told Miles, but give it to the resistance since the Monroe Republic have stockpiled all the firearms. This episode then ends with two cliff hangers. Grace, the woman who saved Danny and has a silver pendent that powered her makeshift computer, is attacked by a person she named Randall. Randall has a pendant himself, which he used to power a baton taser. The second cliff hanger, we find out that Rachel is still alive even though Charlie continues to say that she is dead. Monroe has her in custody and is using the fact that they have Danny prisoner to get Rachel to talk about what Ben knew about the blackout. Two episodes in, I am not totally hooked. I am still interested in the show, so hopefully all of this turns around soon. I guess we will see next week. I blog at CallYourselfANerd.com as well as make videos on our YouTube channel. Come by and check them out. I totally agree. I enjoy the concept of the show, but there seems to be something missing in the execution. I think it has to be the characters that need to step it up, we need to fall in love with them if the show will succeed. Why Gwen Instead of Mary Jane in the Amazing Spider-Man?